Do you have a general tendency of living and pursuing a self-regulation-words-unaware lifestyle, whereby you are used to saying things and not following through with your purposeful actions? Then you need better personal management of your words in your self-development efforts. When you improve your personal management of the words you say, you will be able to focus on developing your ability to do what you say and also say what you will do - no more and no less. 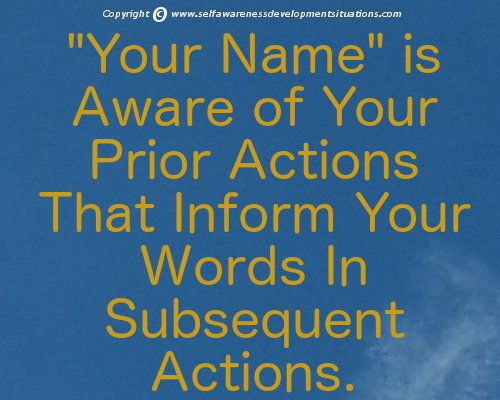 Your key to achieve self-regulation development of your words is to be aware of events, things, processes and phenomena that trigger your thought utterance patterns. Take, for example, your being tired. Do You Respond or React to Events Things Processes and Phenomena When Tired? To respond to something, anything, is to be careful about how you address the issue. But to react is mostly to lash out at something, anything. Now, take some time and assess whether you normally react when you are mostly tired, maybe after a long day of working. Do you mostly respond to things when you are in your normalcy - your normal state or condition? If your reaction comes from being tired, then you have just found the root cause of your lack of response. You are now Aware of thing that compromises your ability to respond to events , things, processes, and phenomena in nature, society and thought. Of course this is just an example. You might find more things that cause you not to respond. This approach also applies to your words. How Can You Develop Good Responsive Abilities With Your Words? You need to develop your own personal management system in your mind that you consciously use to self-regulate your responses. One way is for you to review your entire set of activities in your normal day. Maybe you have too many activities that end up exhausting your energy to a point where you are left with not energy to do other activities remaining in your normal day. For example, you are the kind of person who believes that you must not miss a phone call, otherwise you loose "business". Could it be that too many activities are the actual root cause for the type of reactions that you find yourself in. Take a break! Review your series of action before your responses in words in subsequent activities. This is your best way to develop good responsive abilities in with your words. Any Ability That You Believe You Own - Prefixed by the word "Your" - You Would Have Spoken It Before Owning It. Here is an example using the word "purpose". You can find this word in any dictionary of any language. But when you "travel" with your mind, fetch, download, install and configure - inside you - your purpose, you have just transformed the general word purpose to the particular phrase "your-purpose". To make this more clearer for you take any tangible item you bought in a store - your watch. When a watch is displayed on the shelf of the jewellery shop, it is just a watch. But when you bought that same watch, it ceases to just another watch. The watch becomes your-watch and no one will not be able to see that this is your-watch. You should apply the same serious awareness to your words! Take time to think upon this verbalization and you will begin to perceive victory engulfing you. Think upon the combination - formulate-speak-action.